When I’m looking for a cheap and comforting lunch, pea and ham soup is one of my top contenders. Actually, this particular soup is so thick and filling it can also satisfy as a light dinner too, especially if you add some chunky bread to dunk in. And better still – one serving comes in at just 171 calories! How Do You Make Pea And Ham Soup? 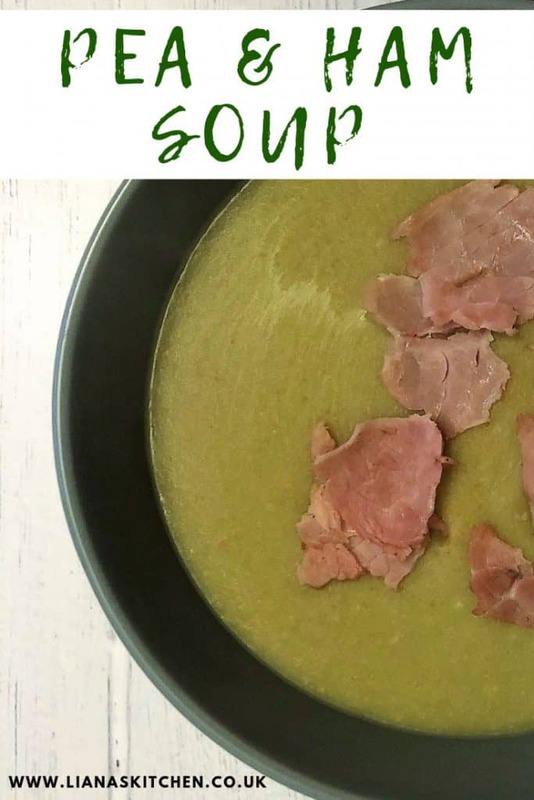 – Pea and ham soup does take a little forward thinking, at least if you are making it in a soup maker. I’ve tried making this soup both with soaking the peas, and without. My short answer is I always pre soak them. If you want to read more about whether to soak them or not, you can read about it below. 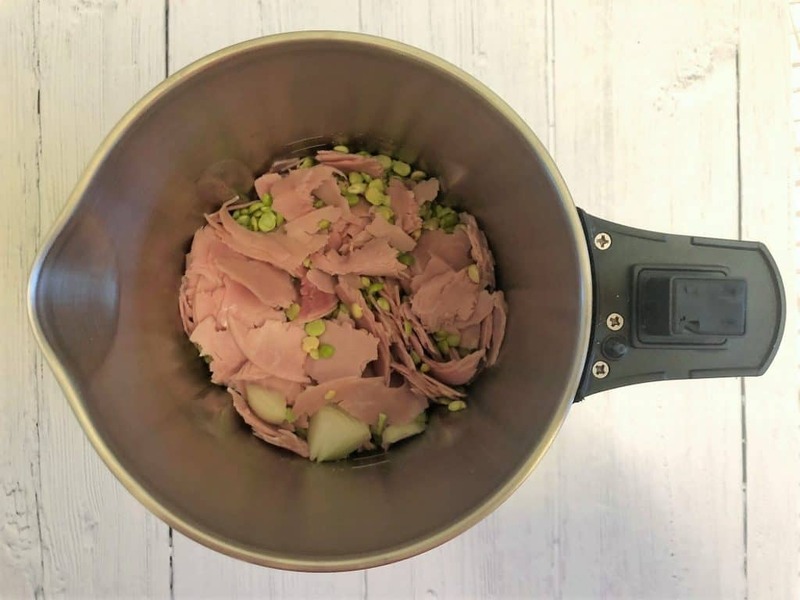 – The only ingredients you need are: onion, garlic, green split peas, cooked ham, stock and any seasoning of your choice. I didn’t saute this one, but you can if you like, just fry the onions and garlic in a little oil. I added everything to the soup maker and made sure it was really well stirred. This is really important to make sure that none of the ingredients are stuck to the bottom. I also kept some of the shredded ham to one side to sprinkle on top of the soup at the end. You can keep all of the ham aside and just stir it in at the end but I quite liked some of it in blended up in the soup. You can use any cooked ham you like but the absolute best in my opinion is any leftover gammon you might have. Remember it already might be quite salty, depending on how you cook your gammon. I’m going to prewarn you on this one – it’s a super thick one! 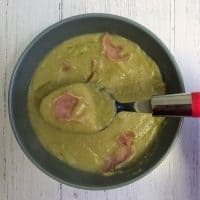 As in you can likely stand your spoon up in it without it falling over 😉 I believe this is THE way to do pea and ham soup but I appreciate that some of you might not enjoy it this way. 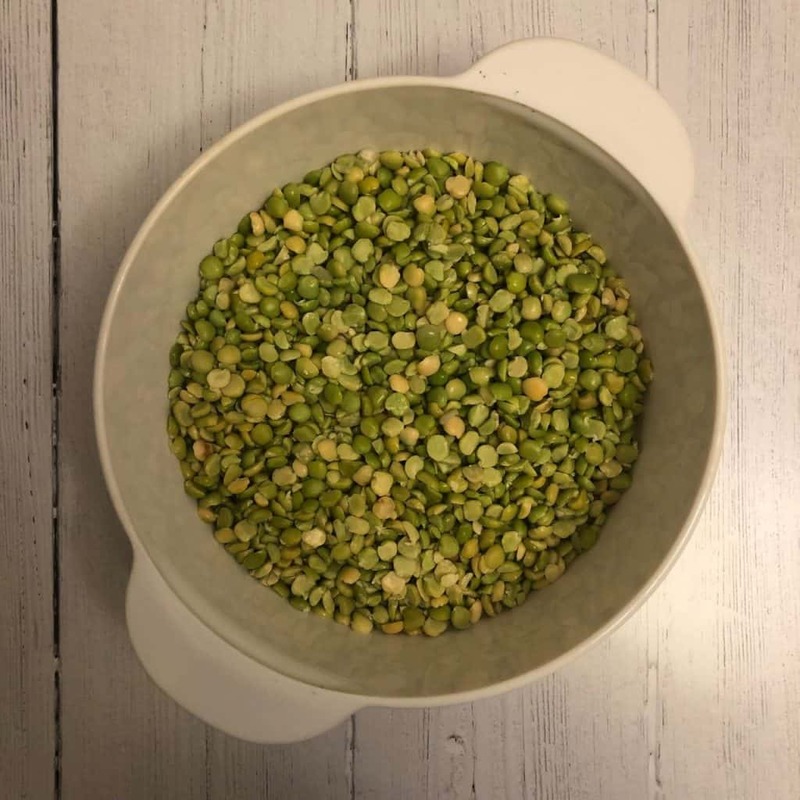 You can make it thinner by either reducing the amount of split peas you use in the first place (go for 200g to 250g instead), or stick to the recipe and just add in some hot stock at the end until it is at the consistency you want it. Can I Make It Chunky? Yes you can. You could make it on chunky and then use the manual blend function on your soup maker to pulse it a few times to get a texture that’s in between. Can I Use Yellow Split Peas? Absolutely. Just substitute them in for the green split peas. There is a subtle difference in taste between the two, but it will still work and be as tasty. Can I Use Frozen Green Peas? Yes you can but this will result in quite a different soup. It will be sweeter and lighter than ham and pea soup made with split peas. Should You Soak Split Peas Overnight? As the soup maker cycle only runs for 21 minutes on smooth, or 28 minutes if on the chunky option, I don’t think it gets enough simmer time without soaking them first. I know that some people don’t soak them first but when I have done this I find the end result way too thick and I think it puts unnecessary strain on the motor of the soup maker. Let me know if you make this soup! I’d love to hear how you found it – just let me know in the comments. You can also find some more soup maker recipes here. 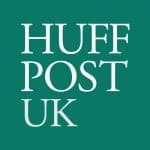 If you would like to join a friendly bunch of soup makers and get some more soup recipe inspiration please feel free to join us over on my private Facebook group. A deliciously comforting soup. 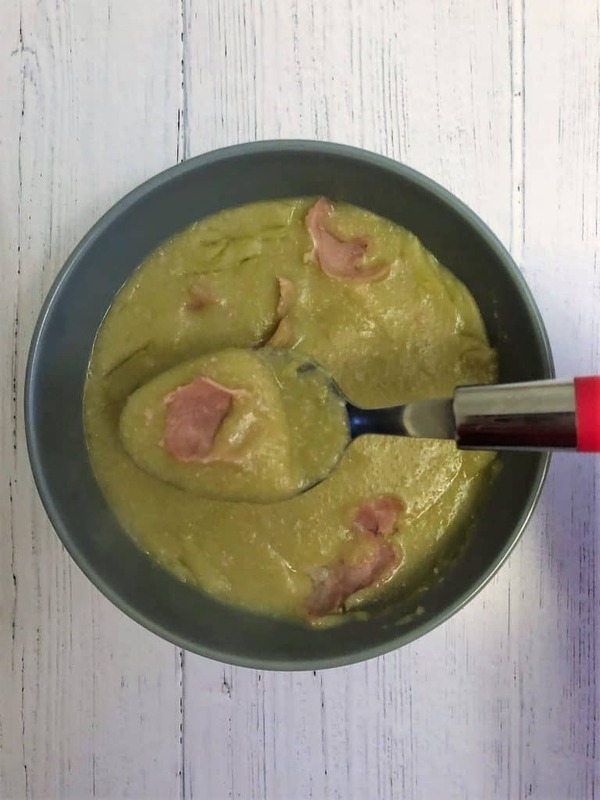 Ham and pea soup is filling enough to enjoy for a filling lunch, or as a light dinner. If you love thick soup, this one is for you! 1. Add everything to the soup maker and make sure you stir it well. This is important to ensure nothing is stuck to the bottom of the soup maker. 2. Set off on smooth. 1. I soaked the green split peas overnight. I know some people don’t soak them but I prefer to and find they cook better. 2. This is a very thick soup (which I think is how pea and ham soup should be!) but if thick soups aren’t your thing you can either reduce the amount of split peas you put in or add some more hot stock at the end of the soup cycle. 3. I added a little shredded ham on top at the end. You can even save all the ham to add on top at the end rather than adding it at the beginning if you wish. Hi Elaine – yes it certainly is a thick one. It is even thicker the next day too! SEE MY BOOK ON AMAZON!